Another day on the bike, so we cycled once more to Cleguerec to see another race, this time a 2nd and 3rd category criterium around the village. The course was 16 circuits of a 5.4 km course, so we positioned ourselves just before the the finish, which is invariably at at the crest of a hill to inflict maximum pain as the competitors vie for the intermediate sprints at the end of each circuit . . . Prior to the race we enjoyed a leisurely lunch at the local créperie, then idled in the Sun as the racers busted a gut to grab the points. 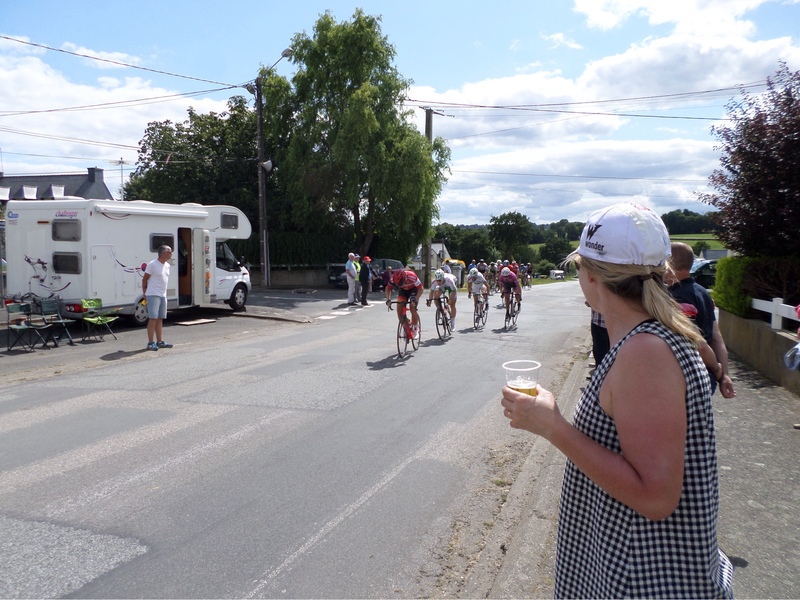 Here you can see S with an energy drink, somewhat selfishly failing to proffer it to the passing riders . . . 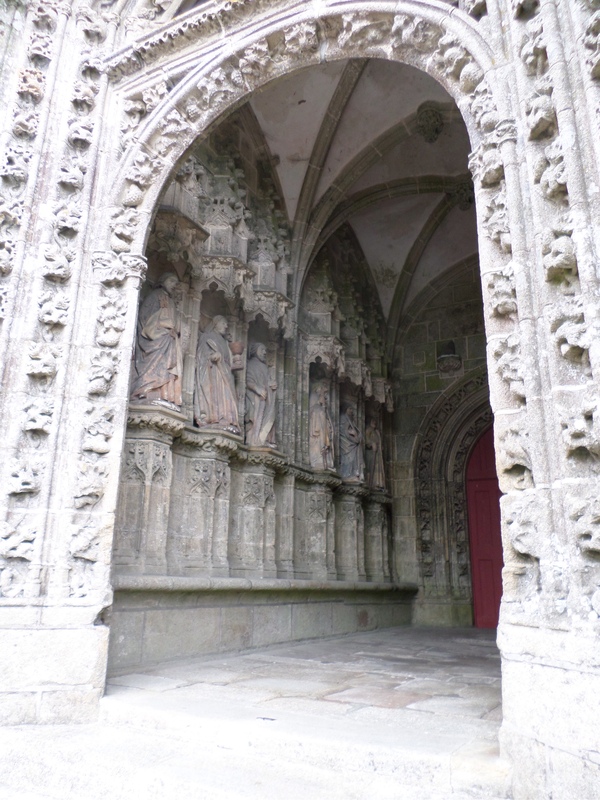 I am serially astounded at the unusual attractions to found in central Brittany. We had decided to take a day off the bike and go out to lunch with Peter & Keith. They suggested that we first have a walk through the ‘chaos’ of Trémargat. 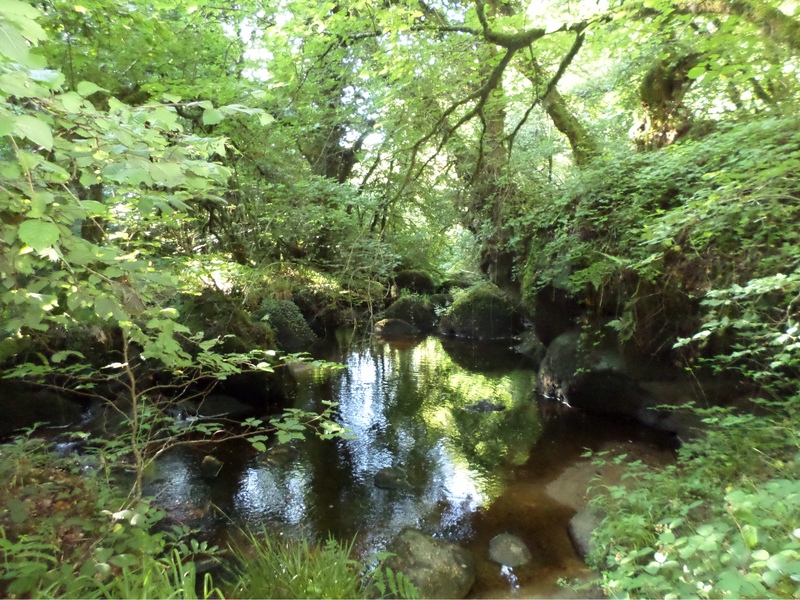 Regular readers will be familiar with the boulder strewn valley at Huelgoat, which boasts the famous ‘Roche Tremblant’, the ‘Champignon’ and ‘Le Gouffré’. In this case, erosion had filled a narrow, wooded river-valley with a jumble of granite boulders at the base, through which the headwaters of the Blavet flowed . . . 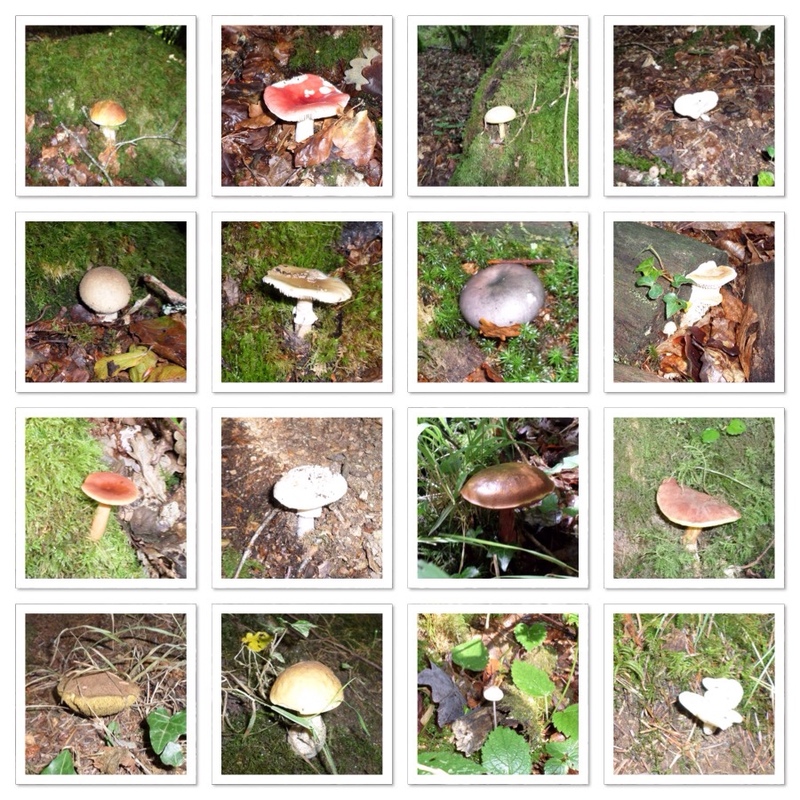 The almost complete absence of visitors meant that the flora remained largely undisturbed, so it was with fascination that I encountered more different types of fungi growing on the forest floor than I have ever seen . . .
. . . family, genus and species on a postcard. I dread to think of the pranks their occupants will play upon us later? After our trek through a this temperate rainforest we repaired to lunch at the Coriandre, a quite unexpected ‘new age’ restaurant in the middle of nowhere, where the food was reminiscent of an Ethiopian restaurant I once visited while in Detroit - which, dear readers, is quite another story . . . Detroit I mean. 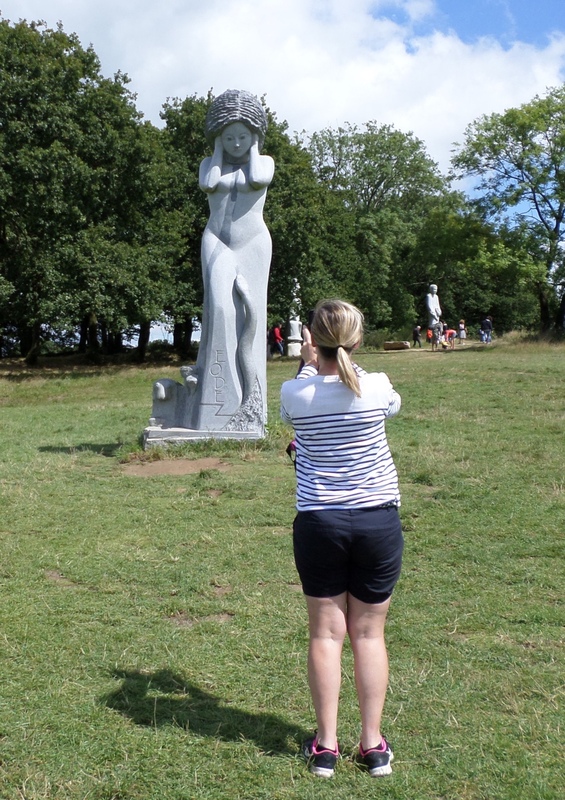 Anyhow, after lunch we were taken to yet another ‘who’d have bloody well thought that this was here’ attraction – a field full of monolithic granite sculptures that represented the celtic saints . . . arranged in a field near Carnoët. The site must originally have been some sort of neolithic settlement judging by its elevated aspect and the motte and bailey type structure at the summit and it was surrounded by scores of sculptures of varying design . . . Here you can see S puzzling over the significance of this particular example . . . 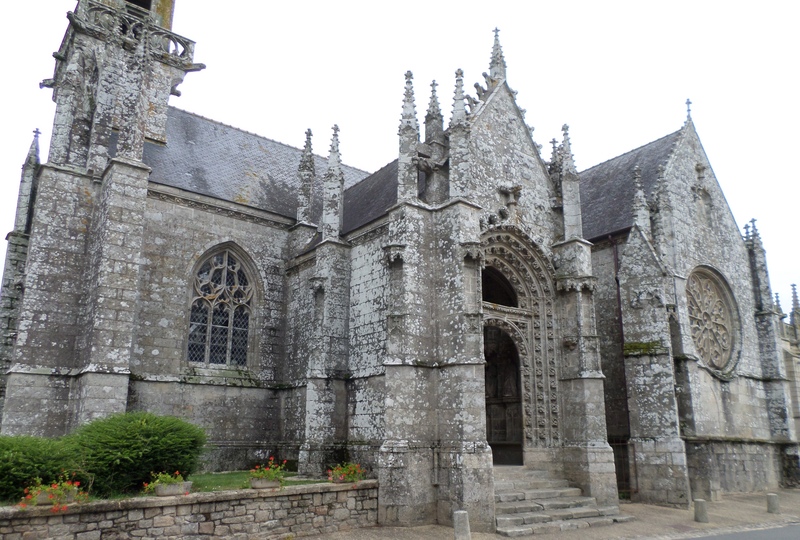 If you’re into compact, granite churches then Brittany is the place . . . in a close tie with Cornwall. We have stumbled across numerous places of worship in our travels, but lacking any particular religious leanings, or enough architectural knowledge to make curiosity worthwhile, they can be a bit of a ‘ho hum . . . yet another damp and musty church’ experience. Nevertheless, for completeness, I feel it incumbent upon me to document our latest stumbling. 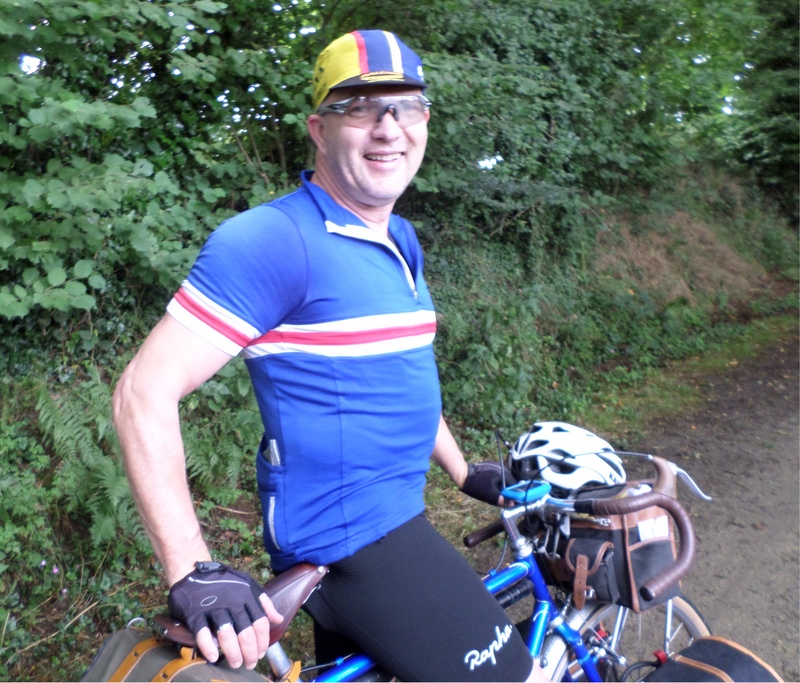 A favourite ride takes us from the gîte to the town of Cléguérec of the famed bicycle pyramid we encountered just after Le Tour had passed through, (see Blog post from years ago, I can’t be bothered to look up which one) and thence on to Pontivy and the Blavet cycle path. This follows the winding course of the river Blavet to St Nicolas des Eaux. This is a 1* site on the Michelin map, which means there is something worth seeing. 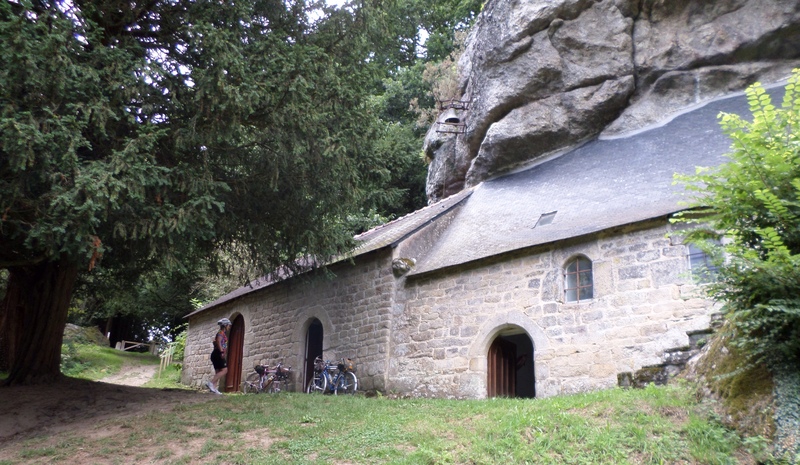 Last year we didn’t find it but, in possession of new information provided by our hosts, we followed directions to St Gildas and found the little Chapel built into the side of the cliff alongside a hidden bend in the river. In contrast, the small village of Kernascleden boasts 2* on the Michelin map. On arrival we were faced with the dilemma of deciding which attraction merited this double accolade. Was it the Notre-Damne church of Kernascléden with its ‘finial-crowned pinnacles and the delicate tracery of its rose windows . . . twelve statues of the apostles in the portico . . . 15C frescoes’ and the ‘right transept dedicated to the representation of hell’ . . .? 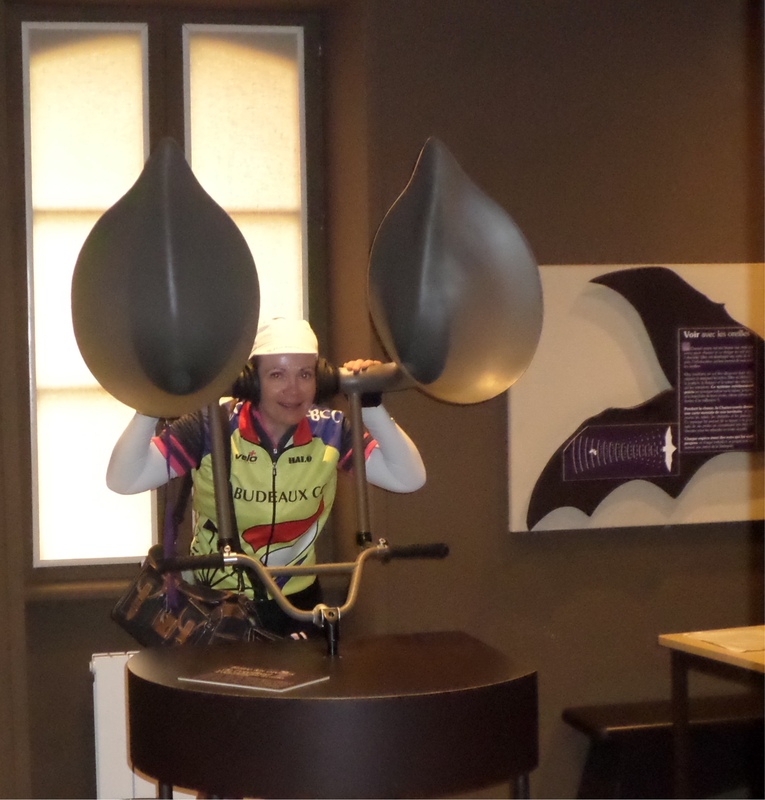 Or was it the magic bat ears in the bat discovery centre across the road?I leave it you, the reader, to decide which of these two competing draws came top of S’s tick list of must-see holiday attractions . . .
On our travels, due to the slow and measured progress that cycling affords, we frequently come across the sights and sounds of nature that would be missed when travelling by car or other forms of mechanised transport. 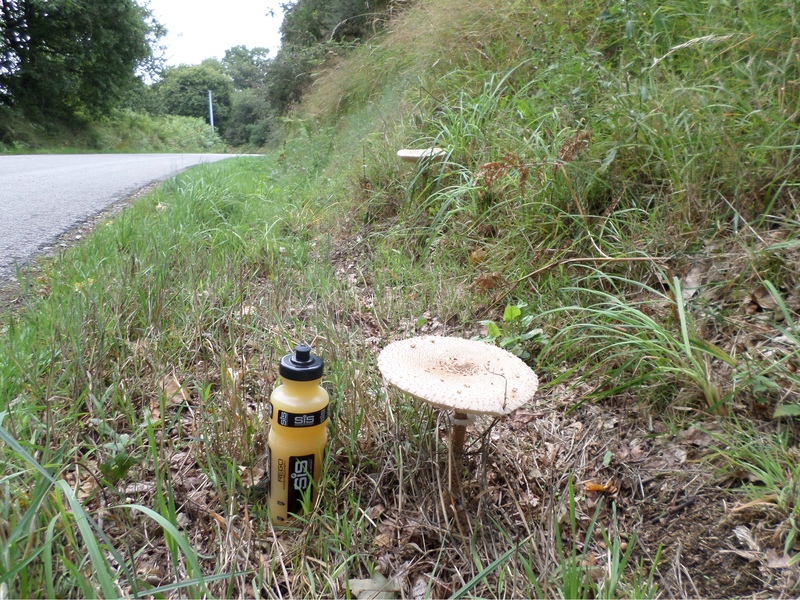 The climatic conditions os this part of Brittany make it perfect mushroom territory, as evidenced by these beauties at the side of the road . . .
Now, regular readers will recall the last time we came across similar fungi (re. Blog post some years ago which I can’t be bothered to look up), and the subsequent realisation that they were home to anoccupant from the fairy kingdom who’s name shall not be mentioned when riding a bike. Being a scientist by training and, as I confidently informed S “lightening doesn’t strike twice in the same place”, we cycled on without leaving a token or offering prayers, or doing whatever is required in these circumstances. 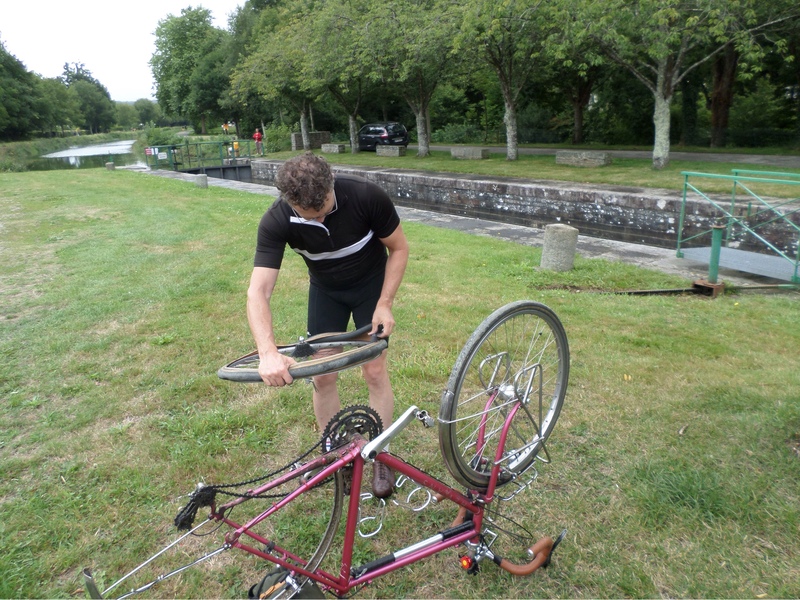 Suffice to say that, later that day as we cycled back along the Nantes-Brest canal, S reminded me that I had been correct in my prediction as I spent a happy hour with the tyre leavers and patches repairing not one but two simultaneous lightning strikes on both bikes . . .
We all know the famous quote that ‘cyclists pedal on their stomachs’. 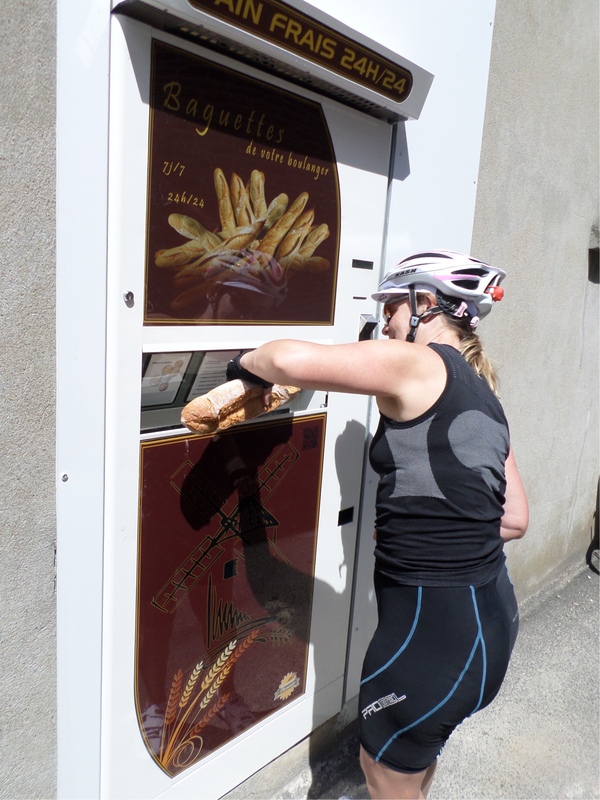 In practice, one of two daily alternatives present themselves: the baguette, which can be hastily prepare and secreted away in the back pocket or bought en route from a boulangerie (preferred, particularly when supplemented by a custard slice or equivalent) or supermarché (DIY version of previous); or the menu de jour from any restaurant which falls within the cyclists price window (i.e. low and narrow). The latter of these two options invariably means the moules et frites, which we have enjoyed once so far on the trip. The former option is a picnic table located in some sunny spot. 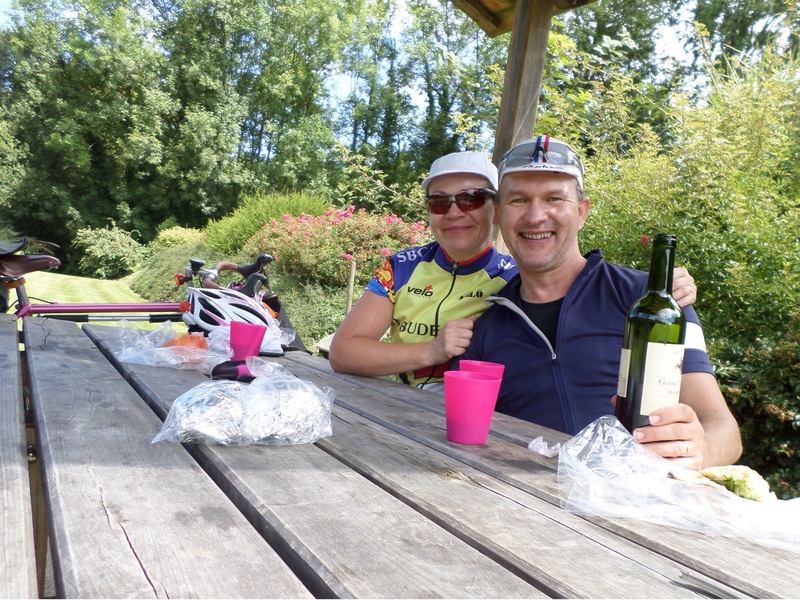 S has previously admonished me for including too much food related material in the blog, thereby giving the impression that we are at an extended lunch rather than actually doing any cycling - evidence for us gaining weight while ostensibly on an ‘activity holiday’. The explanation is simple, I keep reminding her, it is all muscle . . .
One of the advantages of living in Plymouth is the ease of access to the ferry to France. At the merest whim, S and I can throw a few items of clothing into panniers, freewheel down to the ferry-port, buy a ticket and, 6 hours later, we will be munching on a plât de fruits de mer in Roscoff. The reality, of course, is quite different when full time employment gets in the way of such impromptu moments; so instead, there is usually a prequel of spreadsheet-led planning: pre booking of tickets and cabins, hotels and gîtes; fettling of touring bikes and replenishment of anti-histamines and Diacalm; not to mention the pre-holiday haircut. One day, freed from the shackles of work, I will fulfil the freewheeling ideal and keep a set of panniers fully loaded for immediate departure as soon as the sun shines – I might even go camping again if it shines enough, there has to be an upside to global warming. So it was that this year we made the customary annual départ on the Brittany ferries service to Roscoff. Up at 5.30 am to get the 7.30 am ferry meant that the cabin I’d booked allowed us to catch up on missed sleep. 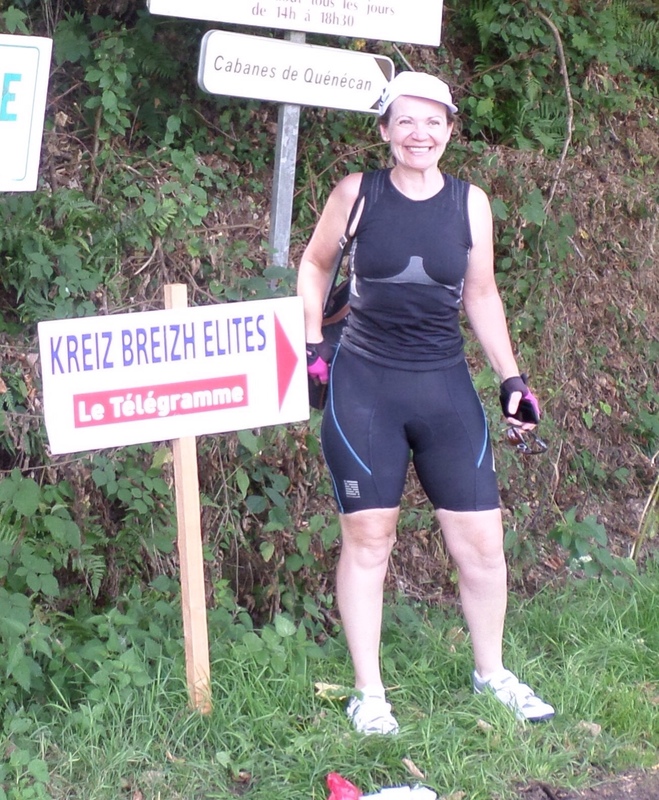 Thereafter, followed the standard routine of cycling to Morlaix, where we stayed at our usual hotel and ate at our usual restaurant. We are now welcomed as repeat customers because, although infrequent, we always turn up at the same time every year wearing the same clothes and ordering much the same meals; as the years slip by we lose track of which was which and can only recall be referring back to this blog. It is after this interlude that the real holiday begins . . . when we set off on the voie verte from Morlaix towards Rostrenen in central Brittany. The voies vertes are a great way to get into the heart of France. They are cycle tracks, often made on disused railway lines and canal towpaths, so are either flat or gently graded. This avoids all the hills, and the old railway lines are generally a direct route from A to B, so shorter. However, surfaces can be variable, so wide tyres and mudguards are essential for a smooth ride – this year, rain made the surface of compacted gravelly-sand quite mushy so, it was harder going than usual and S, accustomed to latching on to my wheel, got more than she bargained for. Maybe I will attach mud-flaps, or maybe not pour descourager les autres . . . It is possible to cycle off road all the way from Morlaix almost until Nantes, first on the old rail route, and then along the Nantes-Brest canal. The canal is actually very sinuous because it is a series of interlinked canalised rivers rather than a completely man-made canal, so it is much less direct, mostly through heavily wooded valleys, very peaceful and teeming with wildlife. We would be cycling as far as Rostrenen on the canal, then going on-road to our destination of Lescouet-Gouarec, on a high ridge of land that forms and east-west spine along this part of Western Brittany. Our, gîte in this quiet village would serve as our base for daily rides out into the surrounding Breton countryside which conceals many unexpected treasures. Luckily, our hosts who own the gîte and live in the old vicarage,have accumulated a list of interesting destinations which we would otherwise have no idea about because they are not the standard tourist fare – but suit us vey well. On arrival, after stocking up on supplies, S and I attended a small arts and crafts fête in the village where we had almost been signed up for a 70 km rando event which was taking place the next day as part of a larger stage race (previously won by Warren Barguil, the Breton cyclist who won this years King of the Mountains in the Tour de France). Feeling a bit sceptical about this, though it was only 70 km, I did a bit of internet research and discovered it was ‘my chance to ride with previous Tour winners’ and join the race route for the last 45 kms to finish within a 3-hour cutoff, i.e. averaging 14.6 mph. Given our current state of fitness S and I decided to give it a miss this year, so we opted for a leisurely ride eastwards to Mûr de Bretagne. This is an oft used stage for the Tour, where the final hill or mûr (wall in French) provides a stiff uphill finish opposite the town, where the road is permanently painted with the names of local cycling heroes. This year, mindful of my previous cajolements to re-enact a final climb of Le Tour, S opted to bypass this signature ascent and opted instead for lunch. So, with this in mind, we carried on to the Abbaye de Bon Repos, where the main race was scheduled to pass at about 14.25. The Abbaye was preparing for its annual son et lumière, which recounts Brittany’s history from Neolithic times to the Revolution. The show is complete with populated peasants’ village, mounted Knights and flaming torches; but that was for another time so, after an extended lunch of the usual baguette, fromage and a small glass of vin to ensure authenticity we awaited the arrival of the race. 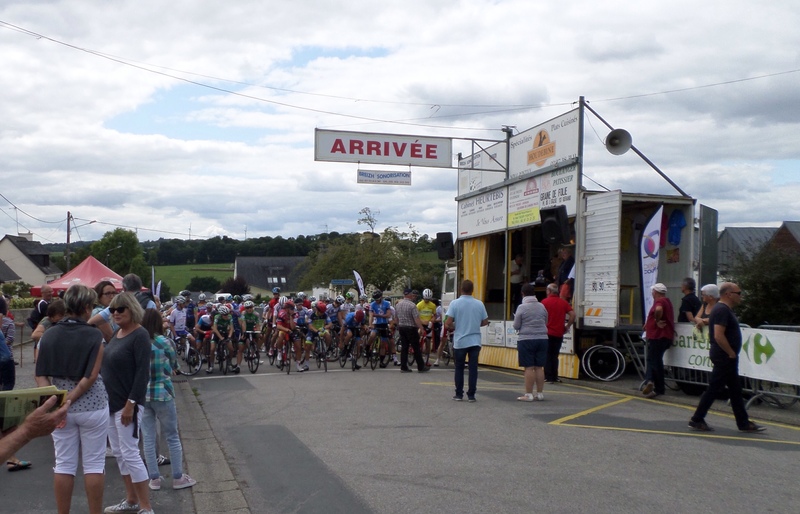 In France, even relatively small cycling events with pro and semi-pro teams have a rolling roll closure with police motorcycles and all the accoutrements of a full stage races, but in miniature. So first there was the local TV van getting ahead of the race to film the major climb, then the caravan of the sponsors (Le Télégramme, the local newspaper) handing out bags of tat, which S made a grab for in true Le Tour style. The gendarmerie on motorbikes to close he road were next, then the race itself and all the team cars following behind. As usual, the actual race itself occupied about 30 seconds of this 30 minute period. One development which seems to be spreading is the 24/7 baguette vending machine. Regular readers will know that I first encountered one of these last year in Caurel – now one has appeared in Gouarec. Nevertheless, this was a welcome sight after the dissappontment of finding the boulangerie fermé after lunch on a Monday. This time S braved the mechanism and withdrew a fully formed pain rustique from within the whirring depths. The next day we opted for a more leisurely cultivation of the mind. Central Brittany, probably because of its rural and unfashionable nature, is home to an eclectic bunch of arts & crafts types, including many British who have cashed in their overpriced, pebbledashed bungalows in the UK and decamped to a converted granite Barn for half the price. But there are other more exotic emigrés which you would never expect . 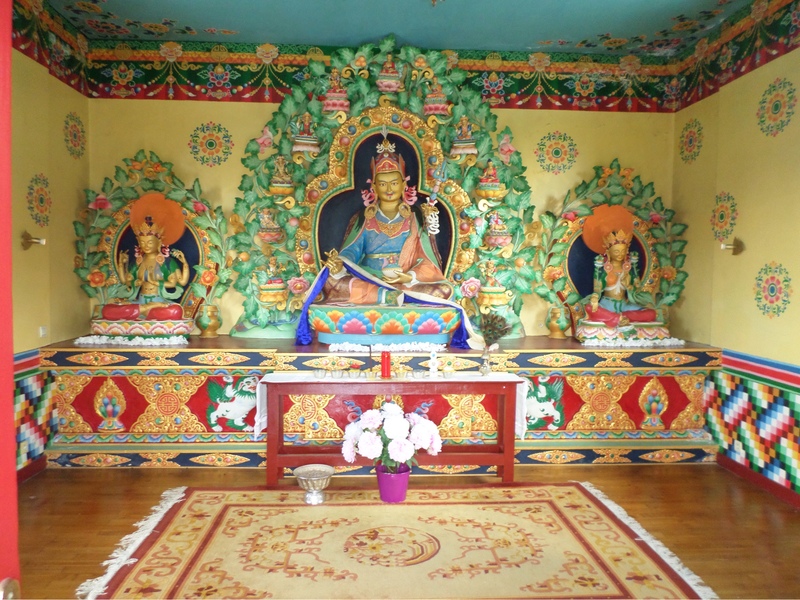 . . so, it was that today we visited the Buddhist temple near Plouray. This is a branch of Buddhism called Drukpa, which was coincidentally celebrating its 1000 year anniversary this August, as evidenced by the marquees which had sprung up all around the grounds to cater for hordes of extra visitors. As usual, S and I cycled into the compound unobtrusively for a moment of quiet contemplation. 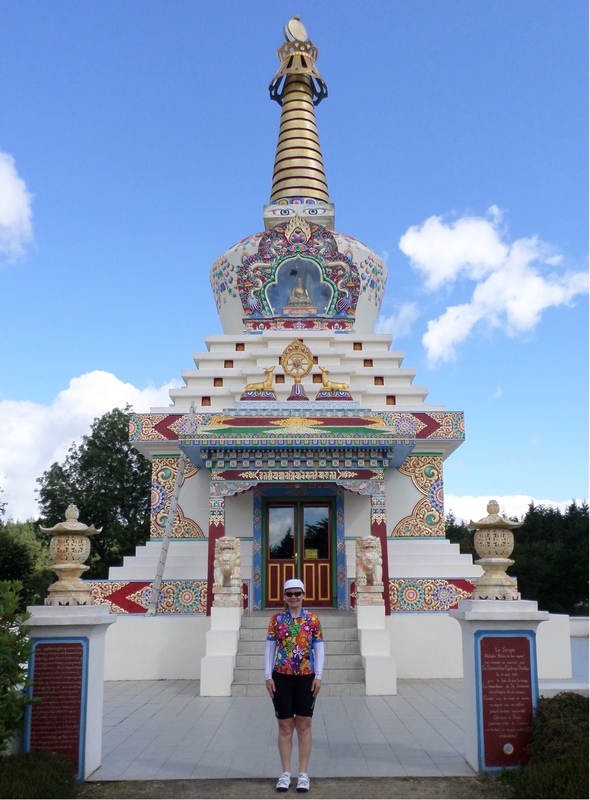 Several monks wandered past as we inspected the temple; S took her shoes off and went inside to commune with the jos sticks while I inspected the newly scrubbed gold leaf on the exterior of the Stupa (temple) – a quite unexpected find in the midst of the Breton countryside which made the trip well worthwhile. I left S to generate some watts at the prayer wheel . . .